Port 25 is blocked by some ISP to prevent spam. My e-mail client can send to any port. Can DRIVEHQ.COM accept e-mail from a port other than 25? In other words are there alternate ports that can be used? Or do we always have to use port 25 when sending to the DRIVEHQ.COM e-mail server? If you have a paid account, you can use the SMTP over SSL on port 26. Most email clients support SMTP over SSL, incl. Microsoft Outlook. Note: DriveHQ email service cannot be used to send bulk emails, spam emails, scam emails, etc. We have automatic software monitoring such suspicious activities and disable bad accounts in real-time. Please let me clarify my question. I travel on business with my notebook PC very frequently. While traveling I use whatever Internet service is available at hotels, airports, train stations, and etc. As such at each location there are different combinations of ISPs and Internet policies in place. At some locations outbound port 25 is blocked for the purpose of preventing spam. My goal is not to send bulk e-mail, but to send a few e-mails per day while on the road. I have a TRUE account. 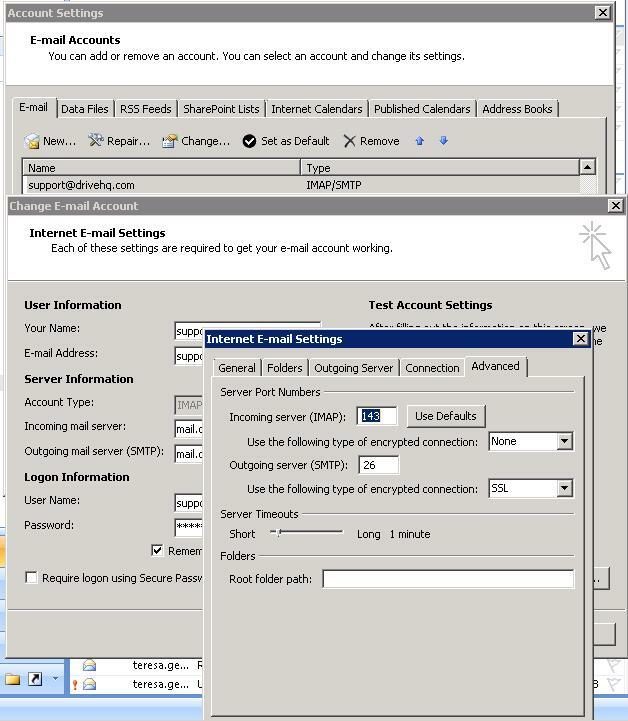 My e-mail client can be configured to send on any port number, but does not support SSL authentication, either none or SMTP authentication mode. Since I can't always have my e-mail client set to port 25 to send e-mail, I would like to know if there are any alternative port numbers that the DRIVEHQ.COM mail servers can receive mail on.